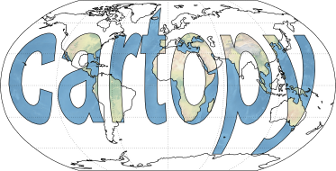 This example displays imagery from a web map tile service on two different projections, one of which is not provided by the service. This result can also be interactively panned and zoomed. 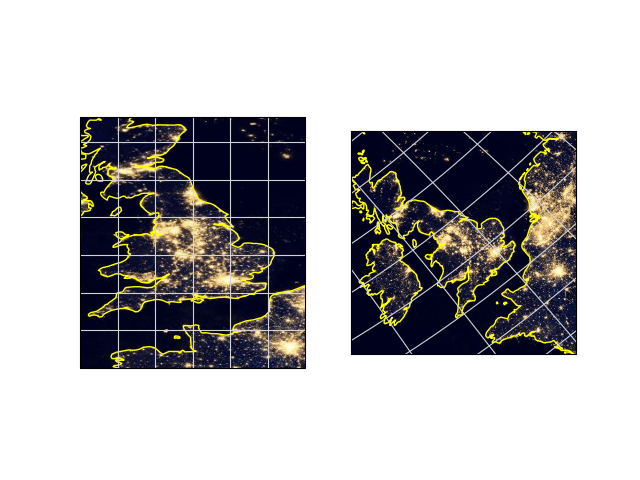 The example WMTS layer is a single composite of data sampled over nine days in April 2012 and thirteen days in October 2012 showing the Earth at night. It does not vary over time. The imagery was collected by the Suomi National Polar-orbiting Partnership (Suomi NPP) weather satellite operated by the United States National Oceanic and Atmospheric Administration (NOAA). # Define resource for the NASA night-time illumination data. # Create a Cartopy crs for plain and rotated lat-lon projections. # Plot WMTS data in a specific region, over a plain lat-lon map. # Plot WMTS data on a rotated map, over the same nominal region.